In such a context here is the question to consider: is an Oxbridge-Lille (a joint Cambridge-Oxford university) or equivalent (e.g., Imperial College-Lille; Birmingham-Nottingham-Warwick-Lille) campus in the Eurostar hub city of Lille  an institutional-organizational level option to reduce risk and ensure stable access to EU nationals (including staff and students), creative UK staff with EU citizenship dreams (for themselves, and their children should they have any), EU research monies, EU-funded research infrastructures, and relevant EU policy-making fora and bodies? Or might the Euro-UK equivalent of Singapore’s Campus for Research Excellence and Technological Enterprise  (CREATE), in a similar location, be a creative post-Brexit option? Or might an equivalent of Cornell Tech  NYC be worth creating in European higher education and research space? In other words, is it time for the UK university-territory relationship to be reconsidered, or at least debated, vs simply waiting and seeing what might emerge over the next 2-4 years via the 'leadership' of Foreign Secretary Boris Johnson, et al? The implications of 'Brexit' for UK universities are many, hence their leaderships' unified argument  and vigorous engagement in the pre-EU Referendum campaign. We heard, for example, about the over-dependence of UK universities upon EU students and staff , and the critical role of EU research monies (especially via Horizon 2020  and the European Research Council ) in supporting one of the most research-active higher education systems in the world. EU Membership and UK Science  (Science and Technology Committee, House of Lords, 20 April 2016). Note that this report was partially derived out of written and oral evidence provided to the Science and Technology Committee, House of Lords (December 2015-March 2016), some of which is flagged below. A complete listing of the submitted evidence is available here . Given that service exports (including education) generate localized expenditures (e.g., housing, food, entertainment) expenditures related to students from non-UK EU countries in the UK was estimated to "generate £3.7 billion for the UK economy and support over 34,000 British jobs. " 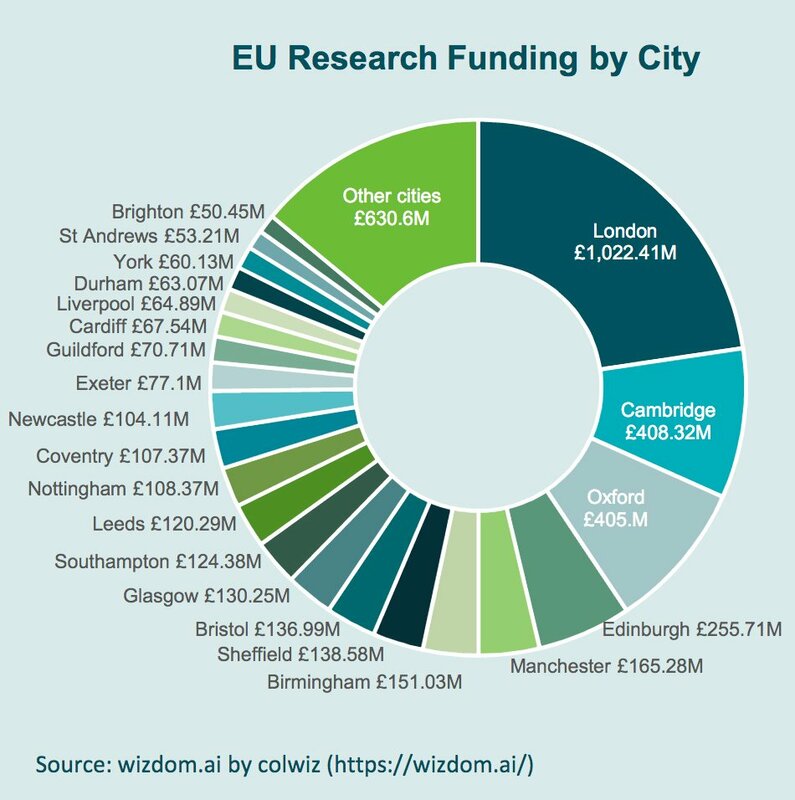 All in all, the UK is an overall beneficiary when it comes to EU-related research money and EU-sourced or supported student and staff mobility. And this does not even begin to factor in the positive intellectual impacts of enhanced cooperation between UK and other EU universities, a phenomenon discussed in some detail by the Royal Society  in 2016, and very much evident to US-based collaborations like myself. It is no exaggeration to state that the Leave win in the EU Referendum was a shock to most stakeholders associated with the higher education community in the UK, in other EU nations, and in regional associations (e.g., the European Students' Union ; the European University Association ; League of European Research Universities ). In short order, major expressions of discontent and concern were expressed in the UK by university associations, individual university leaders, the higher education media (especially Times Higher Education ), and individual staff and students. Concerns emerged about the potential loss of research monies (a prediction apparently being brought to life already due to the marginalization of UK researchers from project proposal consortia ), the ability of UK universities to guarantee right of residency for the many EU staff they depend upon; difficulties in student recruitment,  access to or possible relocation of EU research infrastructures (broadly defined), and the unleashing of xenophobia that has made many non-UK European researchers and students feel discriminated against and unwelcome. On the last point, part of the issue is that non-UK EU nationals are being effectively being told, via coded language, that they are bargaining chips in what will be multi-year UK-EU negotiations about the human mobility and the free movement of workers. No one knows what is going to happen for certain, so we can argue and act in favour of the future we desire. We can, to coin a phrase, take back control of the argument... We are only now coming to think about all the questions and not all the possible answers are obvious." 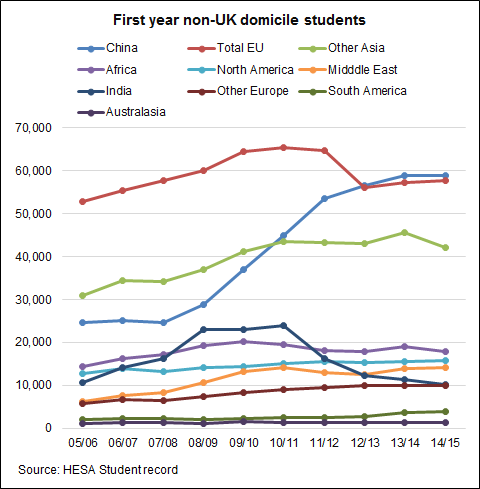 but in a manner that builds upon global regionalisms  (including the development of the ERA & the EHEA) that have helped enable the creation of a more resilient and outward-looking higher UK educational and research system over the last decade plus. Could an 'outward-looking' UK university deal with Brexit-related risk, take advantage of progress in developing the EHEA and the ERA, and contribute to refashioning its future structure and identity by creating a new and deeply embedded campus in a nearby (commuting time-wise) Eurostar station  city like Lille, France, safely in EU-space? 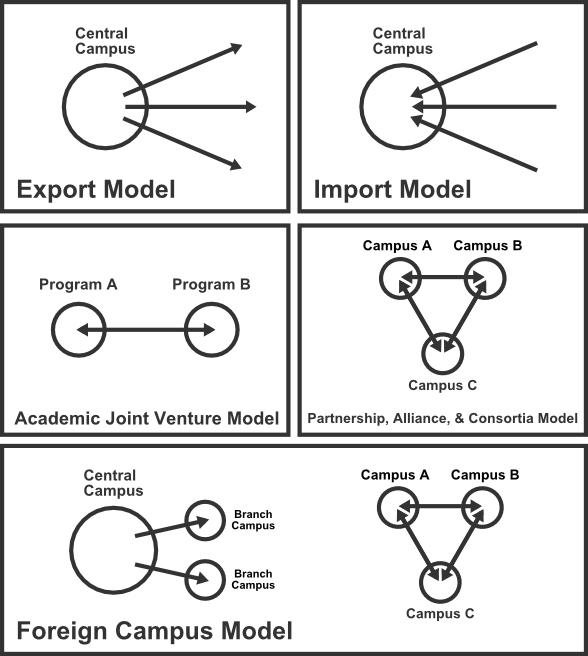 Commercial presence in the EU, to use GATS  parlance, would enable a multi-campus model to emerge like the one visualized in the bottom of the figure below. Source: based on Hawawini, G. (2011) The Internationalization of Higher Education Institutions: A Critical Review and a Radical Proposal  (November 2011). In a process that began in 2010 (see my Unsettling the University-Territory Relationship via Applied Sciences NYC ) a long-term experiment in reconfiguring the university-territory relationship was launched. This initiative is noteworthy from a post-Brexit perspective because it is generative of the formation of deep partnerships between universities from different countries, but in a new & strategically valuable setting. In so doing, partner universities have no choice but to forge deep and relatively trusting relations, thereby going beyond traditional international partnerships that are all too often associated with ghost Memorandum of Understandings (MOUs) with little follow-up. 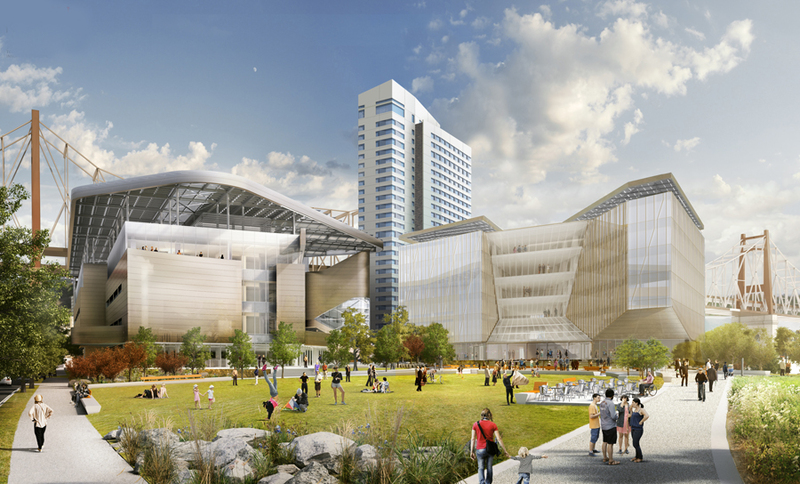 In the case of Cornell Tech , the creation of a partnership node can be opened up, at will, to new partners, while also serving as a prospective site of engagement between Cornell and Technion’s existing partners in the US, Israel, and abroad. This is, indeed, the value of drawing in research-active universities like Technion and Cornell. Other models also exist, including the Euro-UK equivalent of Singapore's Campus for Research Excellence and Technological Enterprise  (CREATE), an option several of us from US universities (including UW-Madison, MIT, Georgia Tech, Texas A&M, Carnegie Mellon) recently discussed at a workshop on International University Research Ventures: Implications for US Economic Competitiveness and National Security . Most international research university ventures are STEM-related, though given what's happening in Europe and the broader region, a case could certainly be made for an innovative UK-EU-Other campus that focuses on global challenges/problems including terrorism, climate change, financialization, refugee crises, risk/uncertainty, and the like. In short, an Oxbridge-Lille (or equivalent) campus is in the realm of the possible, potentially leading to educational innovation within the UK and EU irrespective of what Boris and Her Majesty's Principal Secretary of State for Exiting the European Union (David Davis) are able to pull off over the next 2-6 years. I was in Copenhagen the week before the EU Referendum vote was held participating in a UNIKE conference regarding University Futures . This event, as well as the EU-funded project it is an outcome of, is an excellent of what UK university engagement in EU research and professional development programming can engender. The network structure of the project brought together UK, continental European, and European Higher Education Area-scale faculty, (post)graduate students , postdocs, and staff to explore various dimensions of universities and the knowledge-based economy. The network also extended into Asia and North America. Compared to many North American events focused on similar topics, this was a relatively cosmopolitan gathering; a sign of how 21st century regionalisms are indeed open regionalisms; they are not closed and inward looking, but instead use the phenomenon of global regionalism  to build up capacity of constituent parts to engage globally. There are, no doubt, dozens of challenges (many legal) for why the ideas put forward above might be enormously difficult if not impossible to operationalize, though they're posed here in the context of recognition that, as Nick Hillman  put it last week, "not all the possible answers are obvious."